Your marginal tax rate (and, in many cases, how you expect your marginal tax rate to change over time) is a critical factor in tax planning decisions. One thing that married couples often fail to consider in their planning is that, in the majority of cases, after one spouse dies, the widow/widower’s marginal tax rate will be greater than the marginal tax rate that the couple faced in the years immediately prior to the first spouse’s death. Unfortunately, there is of course no way to know when widowhood will start or how long it will last. I’ve found it challenging to even determine how long widowhood lasts on average. I’ve seen figures from 8 years to 15 years quoted by reputable sources. Regardless, even 8 years is a considerable length of time and merits inclusion in tax planning. Why Does Marginal Tax Rate Increase When One Spouse Dies? After one spouse dies, the surviving spouse (starting in the following year, when they would have to begin filing as single) is left with smaller tax brackets. The 10% and 15% tax brackets are exactly half the size for single people that they are for married couples filing jointly. And the standard deduction and personal exemption of the surviving spouse are half of the amounts that the couple used to receive. As far as income, there is typically a reduction when one spouse dies, but that reduction is typically insufficient to counteract the smaller exemption, standard deduction, and tax brackets. Social Security, for instance, does fall when one spouse dies, but the reduction is usually less than 50% (because if the spouse with the higher retirement benefit dies, the surviving spouse can claim a widow/widower benefit that’s equal to the deceased spouse’s retirement benefit). And investment-related income doesn’t typically decline at all when one spouse dies. How Does This Affect Tax Planning? It is a significant point in favor of doing Roth conversions while both spouses are still alive. Is a Roth Conversion a Good Idea? Even with this simple situation, however, there are three additional points to keep in mind. First, at least in theory, this analysis should be done dollar-by-dollar, because converting isn’t an all-or-nothing question. For example, if you have $500,000 in a traditional IRA, it may make sense to convert some of it. But after you’ve already converted a certain amount this year, you reach a point where your marginal tax rate on additional conversions is higher (e.g., because you’re in a higher tax bracket or because you reach a point where additional income would reduce/eliminate your eligibility for a certain tax break), so the math changes for additional conversions. Second, you must include any applicable penalty when figuring the marginal tax rate on the conversion. For example, if you have $100,000 in a traditional IRA and you move $85,000 to a Roth IRA and $15,000 to your checking account in order to use it to pay the tax on the conversion, that $15,000 would count as a distribution and could be subject to the 10% penalty if you’re under age 59.5. 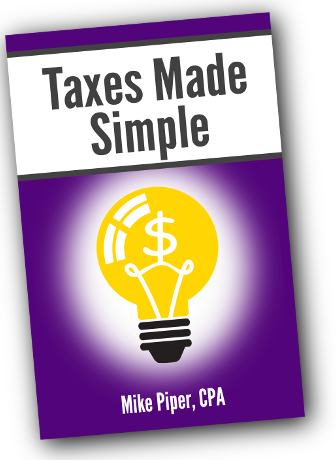 What if You Have Taxable Accounts As Well? With taxable accounts in the mix as well, the analysis becomes much more complicated. In short, having money in taxable accounts typically makes Roth conversions more appealing, because you can use that taxable account money to pay the tax on the conversion, rather than having to siphon off some of the IRA assets to pay the tax. As a result, if you have non-retirement-account assets with which you could pay the tax, Roth conversions typically make sense even if you expect to have only the same marginal tax rate in the future as you have right now. In fact, they can even make sense in some cases in which you currently have a higher marginal tax rate than you expect to have in the future — because the advantage that comes from tax-sheltering more of your assets may outweigh the disadvantage of paying a (relatively) high tax rate on the conversion. Do you have sufficient cash on hand in taxable accounts to pay the tax (or, alternatively, assets in taxable accounts that have cost basis equal to or greater than their current market value)? If you would have to liquidate taxable holdings — and pay capital gains taxes in doing so — in order to raise cash to pay the tax on the conversion, that’s a point against the conversion. As you can see, this isn’t a question to which you can calculate a definitive answer, because many of the factors are unknowable. 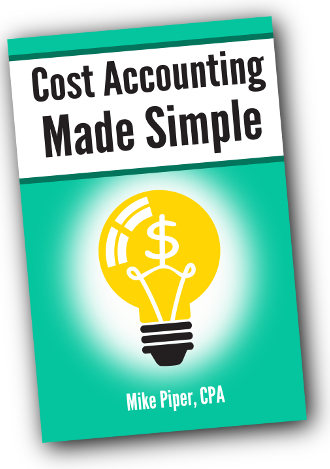 As a result, you may find that it makes sense to take a middle-of-the-road sort of approach, in which you do relatively modest conversions each year (perhaps converting until you reach the top of your current tax bracket) and sometimes converting more in years in which your income (and therefore marginal tax rate) is lower or the market is down (thereby reducing the cost of a conversion). Which Interest Rates Affect Bond Prices? Firstly, interest rates do not move in lockstep. For example, if the yield on 1-year Treasuries goes up by 1%, you shouldn’t expect the yield on 10-year Treasuries to necessarily go up by the same amount. It might go up by more than 1%, it might go up by less than 1%, or it might not go up at all. You can see this by looking at how yield curves change over time. 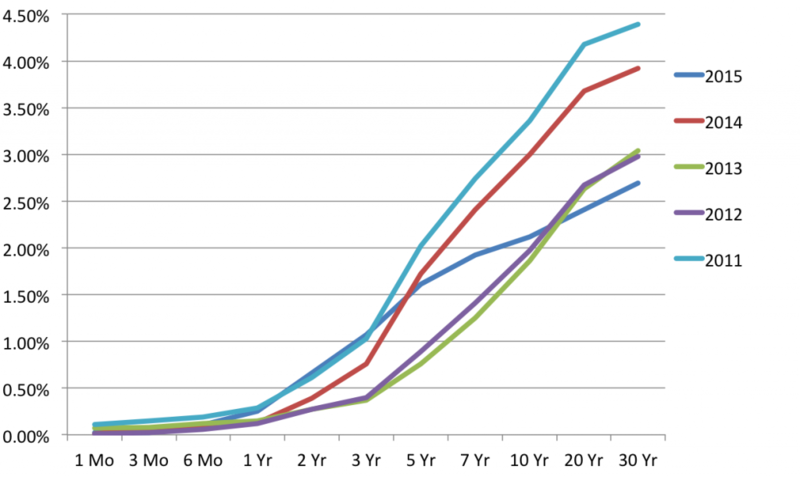 For those who haven’t encountered yield curves before, they are charts that show the yields for bonds of various maturities. For example, the following chart shows the yield curve for Treasury bonds as of the beginning of this year. If interest rates rose and fell in lockstep, the yield curve for Treasury bonds would always have this exact same shape — it would simply shift up and down as rates move. But that’s not the case. 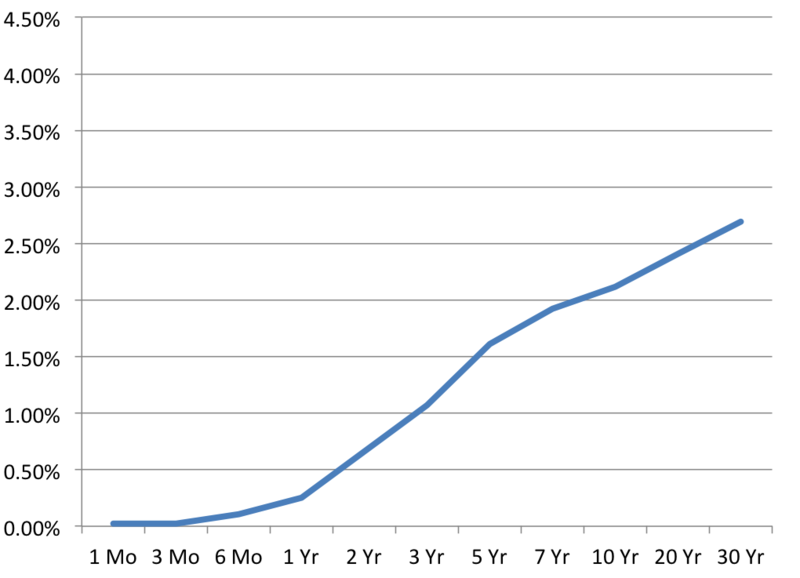 The following chart shows the Treasury yield curve as of the first day of business on each of the last 5 years. As you can see, the lines do not share exactly the same shape, because interest rates did not move in lockstep. As it turns out, over those five years, short-term rates moved around much less than longer-term rates. And the above chart only looks at Treasury yields. If we were to include yield curves for muni bonds or corporate bonds, we’d see even more diversity. So Which Rates Affect Your Bonds’ Prices? Imagine that you’re trying to sell your car. The price you’re going to be able to get for it will depend on what other sellers are charging for cars with the same characteristics (make, model, year, mileage, condition, etc.). The same thing goes for bonds. If you want to sell a bond, it is the yield on other similar bonds that will determine the price that you’re able to get. Or, if you hold a portfolio of highly-rated short-term muni bonds, the market value of your bonds will depend on what happens with interest rates for other highly-rated short-term muni bonds. What Are the Advantages of Tax-Managed Balanced Funds? If we compare the Vanguard Tax-Managed Balanced Fund to the Vanguard Balanced Index Fund, the tax-managed fund is supposed to be more tax-efficient for two reasons: it uses municipal bonds rather than taxable bonds and it skews the stock portfolio toward holdings with low dividend yields. If, however, you’re in the 15% tax bracket or below, it’s possible that skewing toward low-dividend stocks actually reduces tax-efficiency. In that income range, both qualified dividends and long-term capital gains are taxed at a 0% rate. As a result, you’d prefer that a greater portion of the total return show up on your tax return now as tax-free dividends than show up later as long-term capital gains — because later you may not be in the range where LTCGs are tax-free, or tax law may have changed to eliminate the 0% rate. 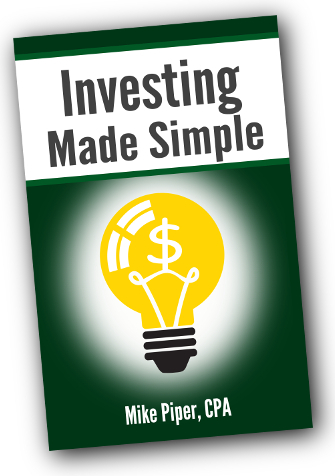 When Does It Make Sense to Use a Tax-Managed Balanced Fund? Personally, I would be reluctant to use an all-in-one fund (even a tax-managed one) in a taxable account. While a tax-managed balanced fund is likely to be more tax-efficient than a normal all-in-one fund, it is still going to be less tax-efficient than a DIY allocation, for two reasons. First, it allows for fewer opportunities for tax-loss harvesting. With an all-in-one fund, you can only tax-loss harvest if the whole fund goes down. In contrast, with a DIY allocation, there will be many occasions on which the overall portfolio is up, yet there’s an opportunity to tax-loss harvest because one particular piece of the portfolio is down. Second, an all-in-one fund (even a tax-managed one) gets in the way of an asset location strategy. (Under an asset location strategy, you tax-shelter your least tax-efficient assets by holding them in retirement accounts. And it is only your more tax-efficient assets that you hold in a taxable account — to the extent possible, anyway.) For many investors, rather than holding a tax-managed balanced fund, it makes sense to hold only taxable bonds (in order to get their higher yields) and simply keep them in retirement accounts — and hold only stocks (which are naturally tax-efficient, due to the low tax rates on qualified dividends and long-term capital gains) in taxable accounts. That said, while I have a low tolerance for hassle, I’m sure there are investors who have an even lower tolerance for hassle. For them, a tax-managed balanced fund could make a lot of sense. In other words, if an investor wouldn’t be bothering to tax-loss harvest or pay attention to asset location in the first place, a tax-managed balanced fund might be just as tax-efficient as a DIY allocation. Is Increasing International Allocation a Good Idea? The most important part of the answer is that I don’t have any strong opinion about the merits of the change itself. We’re talking about 10% of the portfolio (or less, in some cases). And the change isn’t even from stocks to bonds or vice versa. It’s just from domestic to international. In other words, I don’t expect it to have a particularly large effect. I’m not thrilled about the bond change, because I’m not especially enamored with the Total International Bond Index Fund. It has a higher expense ratio than the Total Bond Market II Index Fund (0.23% rather than 0.12%). And, despite having more interest rate risk (due to an average duration of 7.3 years rather than 5.6) and more credit risk, it has a significantly lower yield (as of this writing, 0.81% as opposed to 1.94%). As far as the stock change, it doesn’t bother me. Back when I used a DIY allocation, I used a 55/45 domestic/international split. Also, while I am not the type to make tactical asset allocation changes, with Vanguard Total International Stock Index Fund having underperformed Vanguard Total Stock Market Index Fund so heavily over the last 5 years (6.53% annualized return as opposed to 16.26%), if there was ever a time to move more heavily to international stocks, now would seem to be it. In other words, I’m slightly happy about one aspect of the change and slightly unhappy about the other aspect of the change. But, again, I wouldn’t expect the overall effect to be a big deal. It’s a modest change to a small part of the portfolio. The thing that I most dislike about the change is simply the fact that it’s a change. A big part of the reason that I hold a LifeStrategy fund is to counteract my temptation to tinker — to make it easy to buy and hold a given asset allocation. But, unfortunately, the portfolio is being tinkered with, even if I’m not the one doing it. In terms of changes to target date, it’s important to say that we do expect these portfolios to evolve over time. We are going to continue to do research. We are looking at these things on an ongoing basis and doing formal updates of our analysis around the glide path. We look at it a lot. But that doesn’t mean we’re going to change it. At this point, there are no specific plans to make changes to the target date funds. But I would make sure that everyone understands that it is not something that we set and forget. We’re constantly looking for ways to either improve diversification or reduce costs or provide a better fit for the shareholders. So people should expect some evolution over time. In other words, I do not love the fact that Vanguard changes the Target Retirement and LifeStrategy portfolios from time to time, but I can’t claim to be surprised that it happens.